It's that time of the year when we all want a bit of the luck of the Irish. St. Patrick's Day Cookies may not bring us good luck, but they sure will bring a smile to anyone receiving one. Working with a good sugar cookie (tinted or left plain) base and some lemony royal icing colored in various shades of green, you can create the simplest of designs for quick & easy decorated cookies. Set an afternoon aside for some of these special treats. I think everyone is going to want one. Ever since I can remember, I have loved the color green. Whenever I use green in any shade, whether I set a table with it or say, decorate some cookies, I'll undoubtedly have a smile on my face. Green colored dishes & linens are pretty much an everyday affair for me, but green cookies only pop up in my life a few times a year. You have to have something green on St. Patrick's Day, so why not some sweet edibles like these? 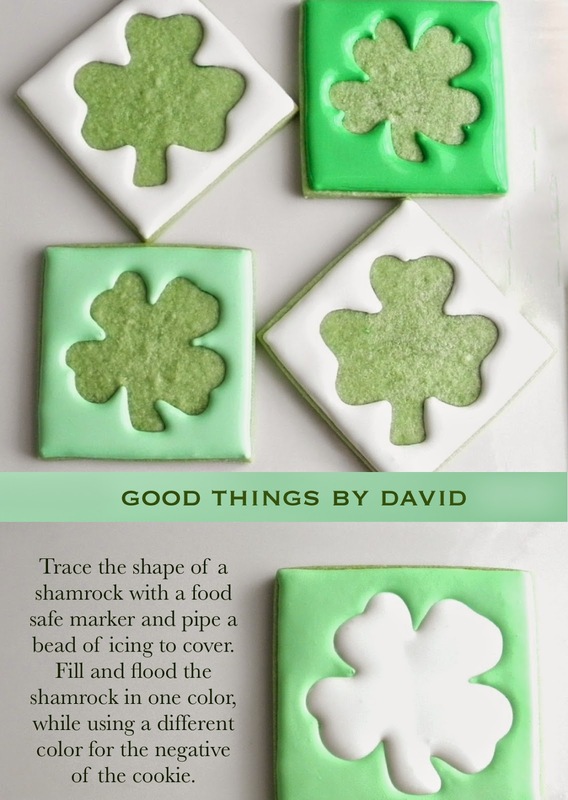 Shamrock cookies: easy, delicious, green & festive! What's even better is that I only used three colors of royal icing for them. I must tell you that I'm having way too much fun tinting my sugar cookie doughs every once in a while. This gorgeous shade of green was made with only 1/4 teaspoon of leaf-green gel paste food coloring added to my Heirloom Sugar Cookie Dough. Remember that it's best to add the food coloring as you're creaming the butter and sugar to get a vibrant dough that is completely saturated. This, of course, is optional. The three-leaf clover is a simple and inexpensive cookie cutter by Wilton and the bottom tin cutter is one from my antique collection of cutters. I love both of these shapes. After your cookies have been baked and cooled, do set some space aside to create your cookies. Set out the tools, icings (I only used 3; white, mint green & kelly green), sanding sugars and that handy cake turntable, and begin icing. Straightforward outlining and flooding a cookie is really very simple. If you leave a little of the cookie's edge exposed, you can then go back and add dots of icing or some other decorative element. In the photo above, I'm showing you how to detect air bubbles/pockets which may form in your icing. Getting rid of them is essential for a smooth finish. Click on the photo to enlarge it. This easy shamrock, three-leaf clover technique is fun. All you are doing is connecting bleeding hearts. Outline and flood the base of your cookie in white royal icing, leaving about 1/4" of cookie exposed. While wet, pipe three dots in the form of a triangle on each corner. For each clover, drag a toothpick through the bottom left dot in a downward arc. Wipe the toothpick clean. Drag the bottom right dot of icing on the right in the same fashion; wipe the toothpick clean. Last, drag the top dot down the middle to connect the clover leaves. That's it! Let this dry and then pipe a border of alternating colored dots. Using green nonpareils for some of these cookies is required! OK, it's really up to you, but if you must know, a four-leaf clover covered in these pretty mini candies is strikingly beautiful. Click on the photo to enlarge to see the technique. For the nonpareil clover, make sure the negative of the cookie which is filled with icing is completely dry. 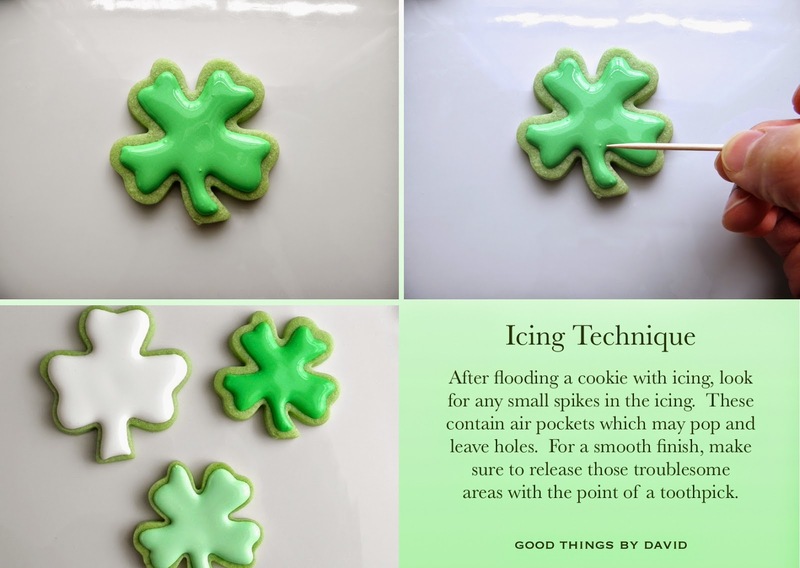 Once dry, flood the shamrock in any colored icing and while wet, sprinkle the nonpareils so that they adhere. Once dry, using a fine brush, remove any excess nonpareils. As you can see, some of the cookies have plain iced shamrocks and others are enhanced with nonpareils. It's up to you what you want for your cookies. 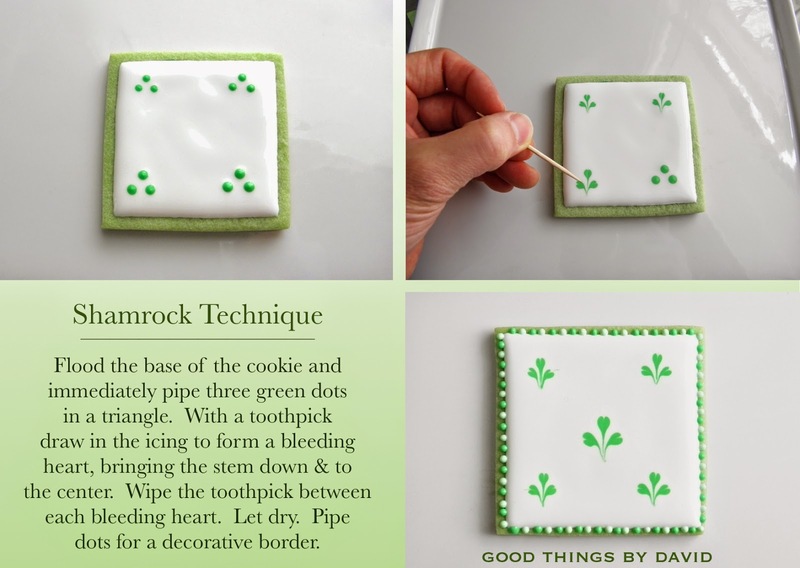 Although it's not essential, you can go back and pipe small dots around the border of each shamrock as a finishing touch. Go to my Cookies Page and scroll through the index of recipes. Look for my Royal Icing and for my Heirloom Sugar Cookie recipes. Create and then share! St. Patrick's Day Cookies don't need to take all day to make if you stick with easy designs. Give the kids squeeze bottles or piping bags filled with icing and let them have a go at some St. Paddy's day fun. I worked with only three colors to create what you see here, so don't be intimidated by making some for your friends, family, coworkers or for your kid's classroom. I can still remember mom (she was a P.T.A. mother!) bringing my classmates in elementary school treats for every single holiday throughout the year. Spread a little bit of luck and good cheer this St. Patrick's Day! As always David, perfection! These are so beautiful! Thank you! I want a cookie the cake stand and the rolling pin! Gorgeous !!!! I can't stop staring at the colored cookie dough! It's a great day for the shamrock!